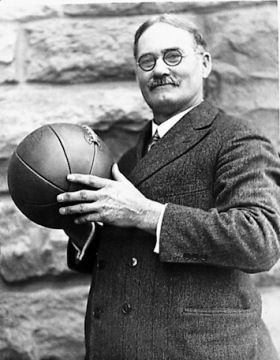 Below are more quotes by James Naismith. There were 18 in the class. I selected two captains and had them choose sides. I placed the men on the floor. There were three forwards, three centers and three backs on each team. I chose two of the center men to jump, then threw the ball between them. It was the start of the first basketball game and the finish of trouble with that class. The greatest team that ever stepped out onto the floor. Basketball is a pure invention. I want to leave the world a better place for me having been here.